Is there a way to specify a custom resolution for CEA mode? Trying to create a custom timing mode for an apple ipad mini LCD. Not exactly sure how to convert the data from the Timing sheet and EDID parse into a correct hdmi_timings value. Especially for landscape view. Its working somewhat for portrait mode, but there are vertical lines that show up when a window is open. 1.) How do you drive the Display (A/D-board connected via HDMI i.e)? 2.) Timing data taken from page 9 in the data sheet --> why can't you use this Timing? aBUGSworstnightmare wrote: 1.) How do you drive the Display (A/D-board connected via HDMI i.e)? Hey @aBUGSworstnightmare, Thanks for the insights. After doing research and learning about the timings etc, i built out a hdmi_timings identical to what you posted. It works well enough for portrait mode, however when i display_rotate=1 it clips the sides. a fbset -v shows it at 1536x1536 which is weird. I have tried ever combination of max_framebuffer and frramebuffer to try and get it to fill the screen. Any thoughts? You need to change your framebuffer from 1536x2048 to 2048x1536 when you want to use it landscape. The timing needs to stay portrait (as per spec). aBUGSworstnightmare wrote: You need to change your framebuffer from 1536x2048 to 2048x1536 when you want to use it landscape. The timing needs to stay portrait (as per spec). Thanks again for following up @aBUGSworstnightmare. Appreciate it. I have tried changing the framebuffer while leaving the timings per the spec, but unfortunately it clips to 1536x1536. if i also change the max_framebuffer to inverted (which to me would make sense to why it was clipping to 1536x1536) then it won't boot up at all (stuck on the rainbow preboot splash page). I'm guessing maybe that is the correct configuration but there isn't enough ram for the GPU to display that big rotated? thoughts? Which Pi are you using and how much RAM have you allocated for the GPU? I've tried with a RPI Zero W set to 256mb as well as a RPI 2b set to 512mb with no luck as of yet. These match the datasheet for the LG panel I'm using. Last edited by noggin on Thu Sep 21, 2017 7:47 am, edited 1 time in total. Did you ever make any more progress on rotating a portrait display without the black bars? I'm attempting to do the same and getting the exact same issue. I haven't tested it as of yet, but hoping to do so this weekend. Although the additional comments / suggestions have been for an iPad 3/4 screen, not a iPad mini screen, so not sure if it will translate. Will keep you updated! We've had a steady stream of requests for supporting HDMI modes that aren't from the official CEA/DMT list of modes. The first three arguments are required. The remaining ones are optional. aspect defaults to 16:9 if not specified. (The fbset gets the console back after closing the display). to make the custom mode the default. Please note. There is no guarantee your display will support the resolution/framerate produced by this. 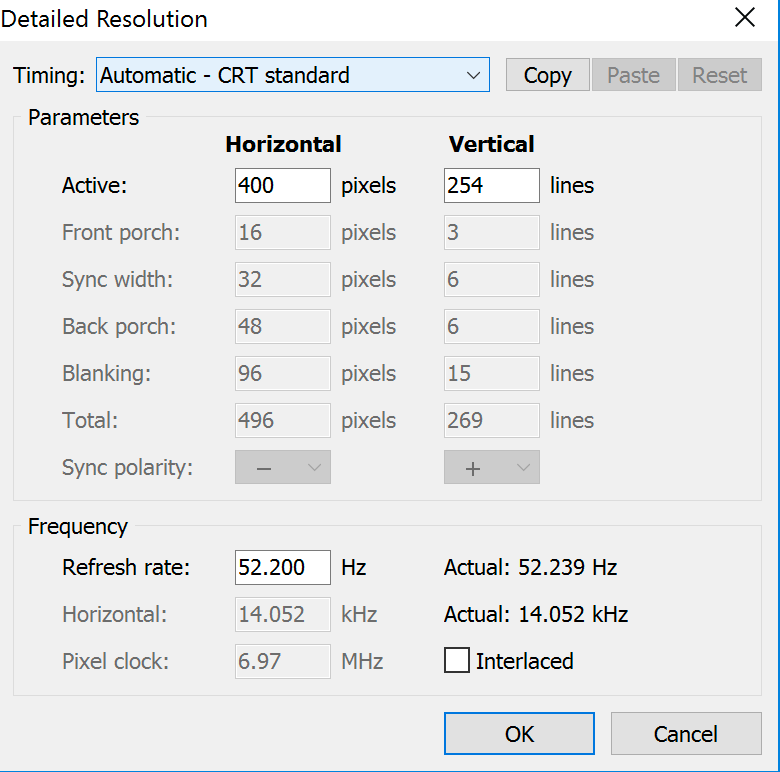 But if you are currently running a monitor at a non native resolution, then this may be worth a try. work in the current Raspberry Pi 3 ? do not include the new resolution. Are you using hdmi_cvt or hdmi_timings as per my post ? I can confirm that what I did works with my unusual resolution panel. What happens if you use a version of my config.txt block with my timings and pixel clocks altered for your display? Hi I'm a noob sorry if I make an stupid question! I have a pvm-14m4u connected with a pi2scart and I'm looking tu run a resolution of 400x254 at 52hz or something near to get native resolution. is it possible to get something near that wierd one? No - my mention of panel was the LCD screen panel. If you look at my posted timings you will see I use hdmi_timings not hdmi_cvt in my config.txt file. My question was whether you had tried using the same options as I have in my config.txt. Isn't the PVM-14M4U an SD CRT broadcast monitor? If so are you sure it looks at such a low line rate? Most SD CRTs will look at 15.625kHz (which is the 625/50 line scan - with 575/576 active lines) or 15734.25kHz (which is the 525/59.94 line scan with 480-486 active lines). You can run at 288/50p and 240-243/59.94p if you don't interlace, but you need to keep your active line count at around 312.5 or 262.5 respectively if you run at p50/59.94 rather than i25/29.97. I'm not sure what you mean by 'native resolution' on a CRT. Are you trying to treat each phosphor triad/triple as a pixel? If so - that's really not how CRTs are used. Can any one point me in the direction of a document or website that can break down the meaning of each of the parameters in the TIMING statement? I downloaded the CRU and entered the known information but I am missing too many parameters to get anything to display. I am using a Pi2JAMMA adapter with a Pi3. Basically the same thing as a GertVGA666 as far as config.txt. Is it possible to create a split screen mode for VR by this method; either by defining it directly in the config.txt or referencing another program such as the E-EDID - I would like a split screen mode right from start-up with tweek buttons, on an Adafruit 5" HDMI backpack without touch screen. The screen is 800 x 480 pixels (aspect ratio of 5:3), is there a way to tell it to draw the screen as two identical 400 x 480 screens with an aspect ratio of 5:6 (portrait mode)? This is obviously just the start, and the GUI interface needs designed to work with a gyroscope etc, but any help in creating the split screen mode used by e.g. cardboard (only using all 384K pixels), would be greatly appreciated. I just got a small 4" HDMI display with the intention of using it to quickly troubleshoot headless Pi systems by reading the boot-up messages. The display is 800x480, 60 Hz refresh. Using the recommended config.txt changes works fine. The default aspect ratio is slightly wrong, but it doesn't seem to make any difference for the text console. So my question is.... Why do I need to specify this via hdmi_cvt at all? The Pi clearly knows that's the best answer, but chooses to use 640x480 instead, left to its own devices. It seems like using its best guess would be a cleaner "default" solution that would allow most displays to work without requiring modifications to config.txt. not really being a "video modes" guru, I'd like to ask for a little help. What would be the right syntax to get a 320 x 200 VGA "Mode 13h" video mode with hdmi_timings? can anyone tell me how it might be done at as low a programming level as possible? However, the pixel clock seems to be always 25Mhz, regardless of what I set as options in the config.txt. also is applicable to the HDMI port? Or is it only valid for the GPIO DPI? However, if I then plug the HDMI cable back in, nothing gets displayed. I don't really know which questions to ask, but I'd be thankful for any pointers!